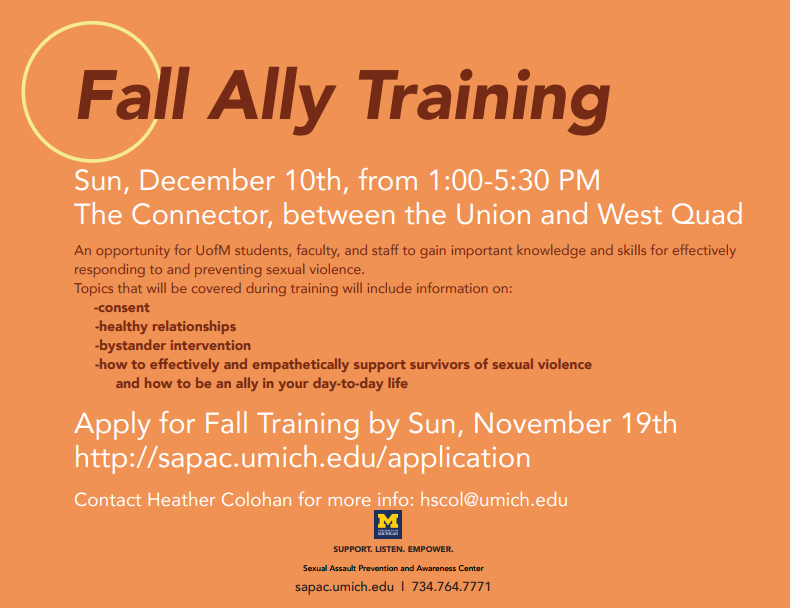 We are excited to host our Fall 2017 Ally Training on Sunday, December 10th 1-5:30 PM in the West Quad Connector! During this 4.5 hour training, we will provide an introduction to topics that include healthy relationships, consent, bystander intervention, and responding to disclosures from survivors of sexual misconduct. Ally Training is a great first step in receiving basic training regarding these issues and becoming a supporter for your peers on campus. Sorority and Fraternity Life Peer Led Support Group (SFL-PLSG) is a weekly, drop-in and confidential group for survivors of gender-based violence. This is a space to decompress from weekly stressors and find support among peers in a comfortable setting facilitated by student staff and an MSW intern. Our group is centered in self-care activities rather than therapy. Meetings provide survivors of Greek Life a space to be present in the moment and build community. October 17, 2017: SAPAC would like to validate and normalize the range of emotions and reactions that survivors on campus and in our community may be feeling in response to recent issues in the news and social media. We are here to listen, believe, and support you. Feel free to call our 24-hour crisis line at (734) 936-3333 or make an appointment with an advocate at (734) 764-7771. Our confidential services are designed to support survivors unconditionally in how they choose to move forward and help them sort through their options. Former PE Volunteer and Co-Coord Yiran Liu, a 2017 LSA graduate, has been nominated for the Rhodes and Marshall scholarships! Yiran majored in cellular and molecular biology and minored in law, justice, and social change, and is currently a research technician and lab manager at Columbia University Medical Center. 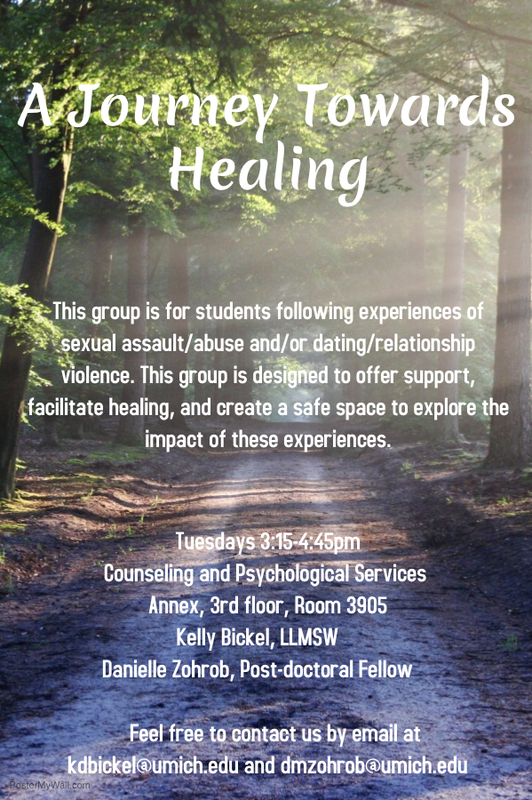 Counseling and Psychological Services is offering an 8-week group for survivors - A Journey Towards Healing. The group will help survivors cope with triggers with less avoidance, restore a sense of power and control, and address intimacy from a body positive framework. This group will start on October 24th, 2017, and will be held from 3:15-4:45 PM at CAPS on the 3rd floor of the Union. Our office hours are Monday - Friday, 9:00 am - 5:00 pm. During the Michigan Union renovation we temporarily moved our location for the 2018-19 school year.